If you have ever felt depressed and experienced a lack of motivation, you have probably been told at some point to go take a walk, hang out with friends, or “just go do something.” It also isn’t news to you that just “doing something” is so much easier said than done. When you feel depressed, it isn’t that you don’t want to do things, it is that getting motivated to do the things you used to enjoy is such an overwhelming task. Depression kills any motivation, interest, energy, or focus you may have and makes daily life, even just getting out of bed, feel exhausting. 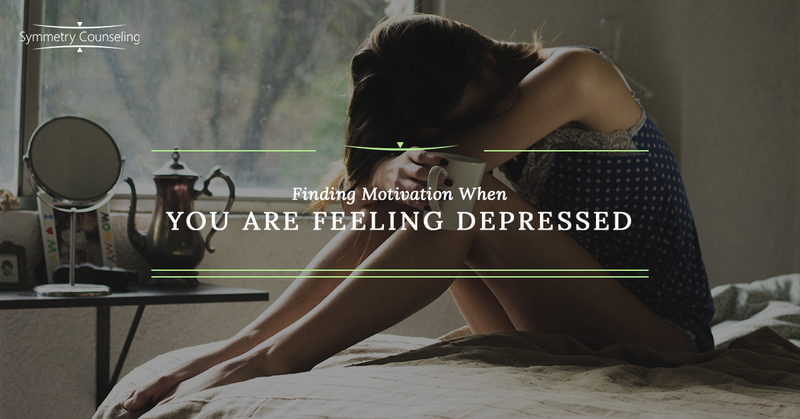 It is not impossible to find motivation when you are feeling depressed and it starts by finding something that works for you. Below are a few strategies you can use to motivate yourself when you are feeling depressed. When you are feeling depressed, you aren’t functioning at your best, and you can’t expect yourself to. If you are expecting to work out for an hour every day when it is difficult to get up to brush your teeth, you may begin to feel worthless, ashamed, or like a failure. Rather than setting your goals too high, start small. Set goals that are attainable and not impossible. One of these goals could be making your bed, doing your makeup, or brushing your teeth. Set goals you can accomplish and cross them off the list! If you have set some goals for yourself and you don’t do them, don’t beat yourself up about it. You may find yourself engaging in negative self-talk such as “you are so lazy”, “you are being anti-social”, “you are a loser.” This kind of thinking will keep your motivation and mood down as these are mean things to say to yourself. Instead, try using more encouraging words such as “you can do this”, “you aren’t a loser just because you didn’t make your bed today”, etc. Being kind to yourself will help you feel more motivated rather than defeated. Whether you need a friend, your mom, or your therapist, don’t be afraid to utilize them. These people in your life are your support and want to be there for you even when you feel they are burdened by you. Ask your partner to hold you to making dinner together, confide in a friend, don’t cancel your weekly coffee date with your best friend, or schedule your therapy appointment. Asking for help is never a sign of weakness and it will help your motivation in the long run. Your depression will try to talk you out of doing your small goals, socializing, or doing something for yourself. Rather than giving into your depression right away, think of how you might feel after you do the task you were going to do. How will you feel after you take a shower, do one load of laundry, brush your teeth, etc.? Focus on how you may feel after these goals are completed rather than how you will feel while you are doing them. Seeing the potential light at the end of the tunnel is motivation in itself. Regardless of the number of tasks you completed or how well you completed them, you got up today and that is worth celebrating. Trying to step out of the routine of depression isn’t easy and even the small stuff is something you should be proud of yourself for. As long as you set attainable goals and aren’t hard on yourself in the process, you should begin to see your motivation improve. Find what works best for you, start small (even tiny if you have to), and be proud of the baby steps you are making to motivate yourself when you are feeling depressed. If you are currently experiencing a lack of motivation or other symptoms of depression and would like some guidance, it may be useful to connect with a therapist. Contact Symmetry Counseling at 312-578-9990 to set up an appointment with one of our very skilled therapists today!